List of forthcoming members' and Board of Directors' meetings, and special events. The North Star Chronicle is Project North Star's newsletter. First nonstop flight across Canada, Vancouver to Halifax, in a Canadair North Star, January 1949. Project North Star is the Canada Aviation and Space Museum’s volunteer program to assist in the restoration of the only surviving example of the military Canadair C54-GM (North Star) aeroplane. 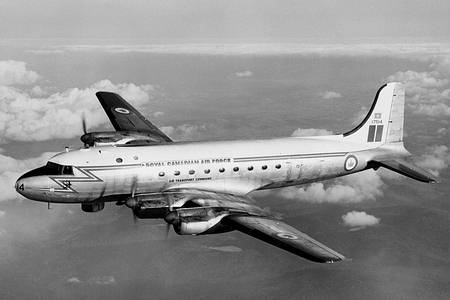 This North Star (Registration # 17515) was built in 1948 for the Royal Canadian Air Force. North Stars constituted the backbone of the RCAF military long range transport capability for almost twenty years until the mid 1960s. Every workday you will find a dedicated team of enthusiastic and friendly volunteers which, working with Museum conservation experts, is making great progress restoring this aircraft. Since the early days of manned flight, nearly one million aircraft have been built, and most will ultimately disappear. Nearly all will perish, regardless of their usefulness, beauty, or effectiveness. Project North Star began with a group of aviation enthusiasts which sees these machines as more than just wood, metal, and fabric. Some of the group were flight crew, ground crew, builders, or researchers, each of whom has a personal connection to the North Star and wishes to see this aircraft preserved for its historic significance. Others in the restoration team simply enjoy the opportunity to do their part in preserving a piece of aviation history. This website provides information on the North Star aircraft and the volunteers of Project North Star. Please have a look at the photos of restoration work in the Gallery. If you would like to help with the restoration of the North Star, we invite you to join our association, Project North Star Association Of Canada, or make a tax-deductible donation by completing the Membership form on the Members page. You can also apply to join our team of volunteers at the Canada Aviation and Space Museum in Ottawa. The Project North Star Team—dedicated to the preservation of Canada's aviation heritage.